The size of this clutch is my fav! It’s so oversized and fits everything I need for a night out. Pairing it with some faux fur really makes it such a lux look. Last night, I had the incredible honor of meeting the one and only Diane von Furstenberg. I was invited to a small party she was having at her DVF store, and I have to say that it was such an incredible time! She was so gracious and sweet, and I was lucky enough to spend time with a few of my favorite OC Bloggers as well. It was a night I won’t soon forget! Hope you all enjoy a spooky Halloween! Thanks for reading! I’m always a huge fan of leather anything come fall, but the one item I didn’t own yet (surprisingly) were a pair of leather crop pants. Instant love! I can’t wait to style them with an oversized chunky sweater too. Now if this weather would just cooperate and stop being so warm! 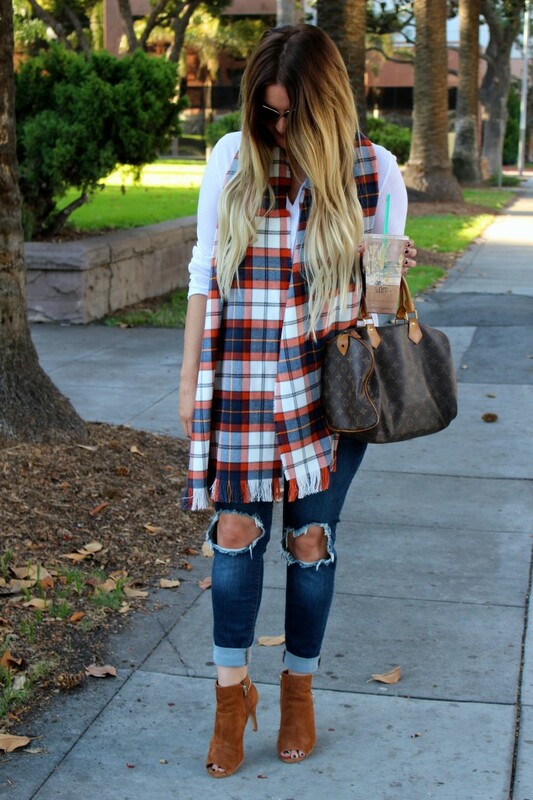 I love wraps and oversized scarves in the fall. This one from Asos is super comfy and I know I’ll be living in it all season. I also got these boots last year and was worried that I may not get much wear out of them because I was unsure about the color, but so far I have pulled them out a bunch already. There is something so rich and fabulous about this color. Fall is slowly inching it’s way closer to us. OK, maybe not with the weather here in Orange County but definitely with my wardrobe and decorating the house! Like most people, it’s my absolute favorite time of year. There is something about pumpkins around the house and the warm glow of candles that just make a home feel that much more special. 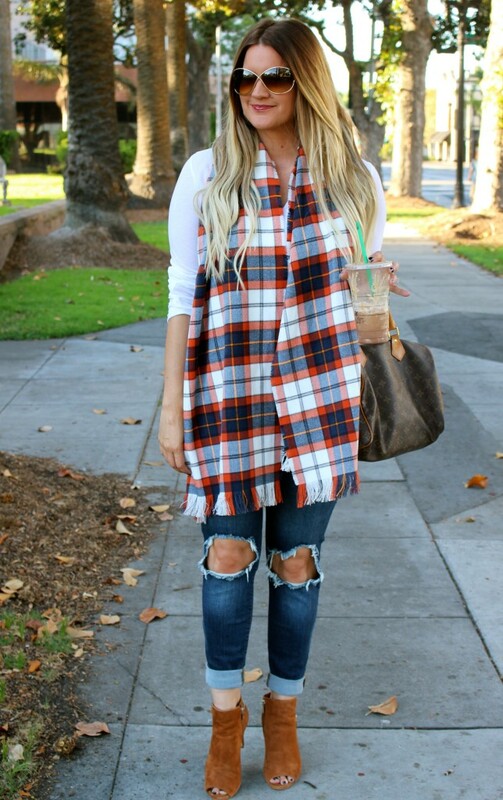 Having another plaid moment on the blog, but it’s so hard not to with all of these perfect pieces! 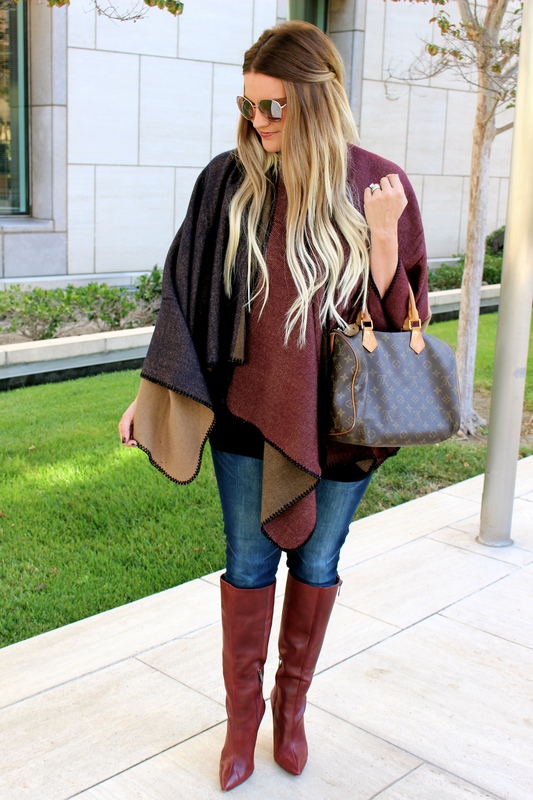 Over-the-knee boots are hands down my favorite footwear for fall. They are the one item I probably couldn’t live without! I couldn’t believe the price point of these boots from Forever 21. I know how expensive a good pair can be, so I consider myself lucky that I stumbled upon the perfect pair for a crazy perfect price (and they come in 3 colors! ).